Today Stephanie from Life Tastes Like Food is contributing a mouthwatering delight that looks perfect for an upcoming Holiday party. I met Stephanie when she asked me to guest post on her Holiday Project Series; my contribution will be published later this month! Stephanie also lives in San Francisco and I am excited for her guest post today! Hi, Everyone! Stephanie from LifeTastes Like Food here. It’s so wonderful to be on Simply Scrumptious today! I love this time of the year because the holiday season brings about an array of festivities!! Whether it’s an ugly sweater party,company holiday potluck, or family gathering, I find no better environment than to incorporate a little cheese into mix! 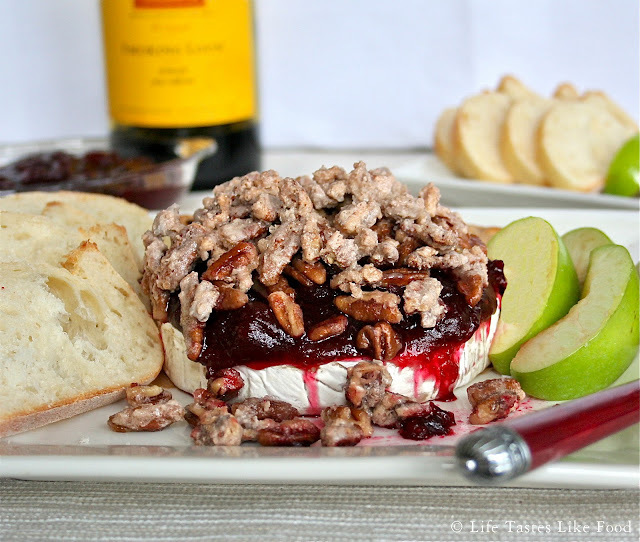 This appetizer incorporates holiday spirit by bringing together warm spices, depth from the red wine, and a tangy cranberry flavor that compliments the brie quite nicely. And when you add some crunchy pecans on top and throw everything in the oven, you really can’t go wrong. This recipe is great for any gathering. 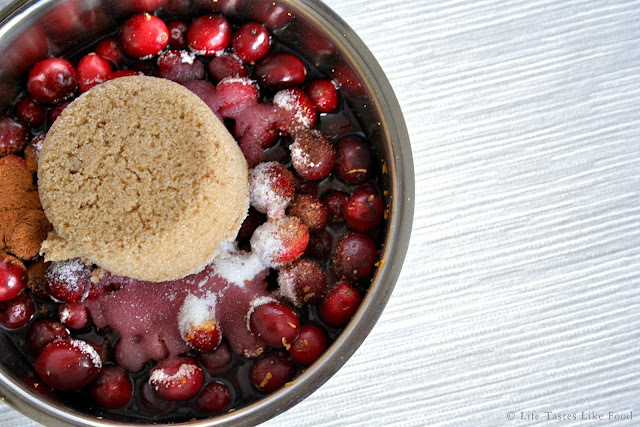 It’s extremely simple to make and will be a hit at any holiday party. You can even assemble everything beforehand and then just pop it into the oven before your guests arrive! You can serve it with crackers, bread, apples, or anything else that fits your fancy. While making it, pour yourself a glass of the red wine and enjoy while cooking! You deserve a break. 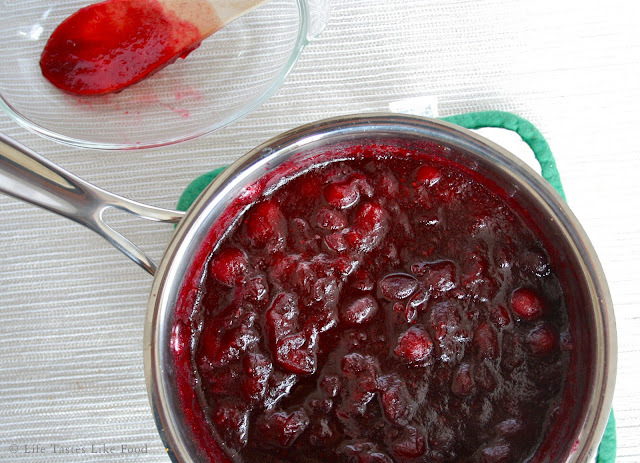 First, make the cranberry sauce. 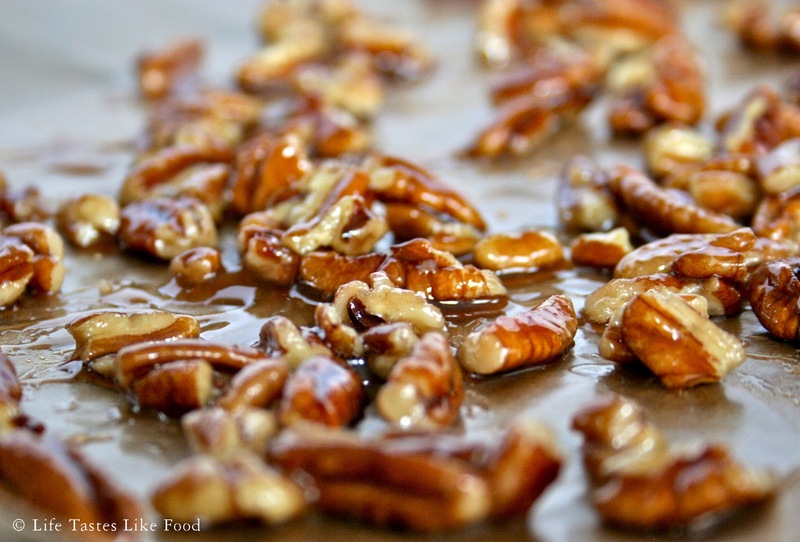 Next, prepare the glazed pecans. I would do this right before you are ready to bake the brie but if you want to prepare them ahead of time, then make sure you spread them out on a piece of wax or parchment paper to cool. 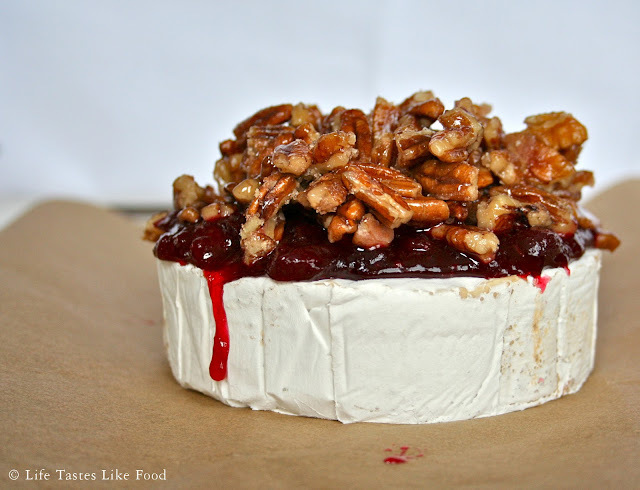 If you make them right before you bake the brie, you can skip that step. Then, preheat your oven to 350 degrees and using a knife,make a circle about ¼ inch from the edge on the top part of the brie. With spoon, scrap away the white part of the brie. Pile on ½ cup of the cranberry sauce and pecans, like so. Bake for 8-10 minutes. Make sure you watch the brie carefully because it you bake too long it will melt into a gooey mess…and wedon’t want that. Now go eat, drink, and be merry! Happy holidays!!! Using a knife, make a circle on the top of the brie wheel with a ¼ inch border from the outside. Take a spoon and scrape off the white of the inside part of the circle. In a separate pan, cook the water and sugar for the glazed pecans on high until the mixture thickens. Then, reduce the heat to low, add the pecans and toss to incorporate. You can then spread the pecans out on wax/parchment paper for it to cool, but I suggest putting it on the brie right away so to avoid this extra step. Take the brie wheel and place it in an oven-safe dish. Add ½ cup of cranberry sauce to the top of the brie. Then top everything off with the glazed pecans. Bake the brie for 8-10 minutes, watching it carefully. Serve immediately and enjoy! Tip: It’s best to bake the brie in the dish you want to serve it in. Transferring it to another plate is where it gets a little tricky!But if you must transfer it, bake it on parchment paper, move it to the new plate while it’s still on the parchment paper, then cut/tear the parchment paper around the brie (so the paper is technically still underneath the brie when you serve it). Unless you’re fantastic with a spatula, this is the best way to go. *This makes way more cranberry sauce than needed for the brie, but I always like having leftover sauce for other dishes. If you don’t want to make that much, cut the recipe inhalf—you should still have a little bit left over. Stephanie from Life Tastes Like Food loves to frost things and drink tea. When it comes to trying out new recipes,whipping out old ones, testing new restaurants or purchasing something random at the grocery store, spontaneity and lack of willpower to constrain herself come hand-in-hand. She believes there is a personal connection through food to life and that you can contribute many concepts from cooking and baking to life's everyday lessons. This looks really intense! Perfect for the holidays. This is a great started for holiday potlucks and cocktail parties. Festive, Fresh, and Delicious-- great post! this looks positively divine! can't wait to try it! What kind of wine do you use for this? 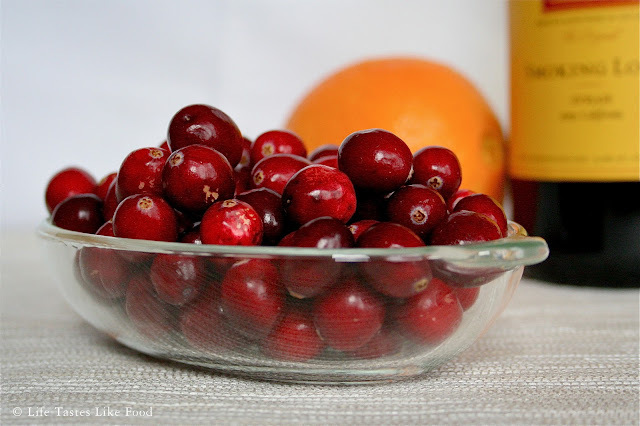 Is it ok to cut the cranberries in half or quarters if you don't want them to be so big? إن شركة تنظيف الشقق بالاحساء من الشركات فىالمملكة التى تقدم الخدمة المتميزة عن أى مؤسسة أخرى بإذن الله الشركة رائدة على كل مجالات وأقسام خدمات النظافة بالاحساء , فشركة إتقان بالتأكيد تجد منها الإتقان والتميز كل يوم مع مرور السنين تزداد الخدمة حلاوة ومتعة فى قضاء الوقت الرائع ما عليك إلا الإتصال بنا وسوف تجد خدمة لم ولن ترها فى حياتك من أى شركة سوى عندنا لأن إتقان إسمٍ على مسمى وأسعارنا جداً خيالية بل ممتازة ستجد هنا كل ما بغيت ان تراها وحلمت بة بإذن الله بالطبع , إتصالك بنا شئ يشرفنا ويسعدنا لأنك عميل مميز لدا شركتنا وجميع طلباتك تنفذ فى الوقت بدون أى جدال أو نقاش انت اذا كنت تبحث عن أفضل شركة تنظيف شقق بالاحساء فانت فى الموقع الصحيح بل فى أعلى درجات من الصحة كلامنا كلام من ذهب وعملنا عمل من إتقان ولهب , التميز ليس عندنا فقط ولكن فى بعض الشركات الأخرى ولكن انت هنا الآن لما تحتار نحن الأفضل وسوف ترى ذالك بالتأكيد ليس مجرد كلام ولكن أفعال سوف تراها الششركة تعتمد على العمالة المدربة وكذالك الفلبينية والمصرية ولكن نحن لا نفرق بين أحدٍ منهم لأن كلا الجنسيتان رائعتان فى الخدمات المنزلية متقنون فى تنظيف الشقق بالاحساء شركة تنظيق بجازان . نمتلك أفضل الرجال المتخصصون فى تنظيف الشقق ومدربون على إستعمال الأدوات بإحتراف. نمتلك أحدث الأدوات الحديثة والتقليدية للقيام بعملية تنظيف مثالية. عمالنا يمتلكون الخبرة والمهارة فى القيام بأى مهمة فى أسرع وقت. نمتاز فى أسعارنا وعروضنا الكثيرة والتى لا تنتهى أبداً. نضمن لك بيتك بأن يكون نظيف معطر بأفضل أنواع المعطرات ذات الرائحة المنعشة. نقوم بتعقيم الحمامات والخزانات وحمايتك من الأمراض الشائعة والعياذ بالله. نتماز بأننا أثبتنا وما زلنا نثبت بأننا شركة ذات مصداقية وآمان تام. نتمنى أن تكونو قد إستمتعتم بمعرفة مميزات شركتنا ولمذيد من التفوق والإنجاز. نعلم جميعاً أن عمليات التنظيف هى أمر جداً يحتاج إلى تركيز ودقة وإلى لياقة بدنية من العمالة الفنية ولا تستطيع أبداً أن تعتمد على شركة تقدم خدمة ذات اداء ردئ وعمالة ليست مدربة على أفضل وجة ولكنك الآن فى شركة إتقان الشركة المثالية للخدمات المنزلية كل ما عليك أن تفعلة سوى الإتصال بنا وسيتم الإتفاق على معاد التسليم ونقوم بتسليمها لك إستلاماً دقيقاً,نحن متواجدون لخدمتك وجعلك لا تبذل أى جهد لتنظيف منزلك الكريم إذا كنت تبحث عن الشركة الأحسن فى المملكة فشركتنا هى الأولى فى مجال الخدمات المنزلية منذ شهور أثبتنا ذالك للجميع,هذا بفضل الله عن طريق إستخدامنا لأفضل أنواع المعدات المنزلية المستوردة من الخارج والعمالة الفنية المصرية ذات الجودة والخبرة العملية وإذا كانت رغبتك فى الحصول على خدمة تنظيف مثالية بدون عناء وخدمة أحسن نظافة عن أى خدمة آخرى إذن أنت فى المكان الصحيح إتصل الآن نصل ملاحظة الأسعار حسب حجم المنزل أو حجم المهمة ولاكن ستتفاجئ بالسعر الذى نقدمة شركة تسليك مجارى بجازان .